If Jeep Australia are listening to the social chatter following The World’s Most Remote Dealership promotion, It will realise 1000-odd users are spitting on their brand and muddying their reputation. At the weekend, member numbers between two groups on Facebook; If you think the JEEP give away was a scam and Jeep Fiasco Class Action Lawsuit, swelled to more than 1000 people with reports emerging disgruntled Jeep fans had to be escorted from various dealerships. Scott Franks, creator of the group, ‘If you think the JEEP give away was a scam’ has compiled a petition and formally lodged the case with a Sydney law firm after discovering the following clause in the promotion’s terms and conditions. If for any reason the Promotion is not capable of running as planned (whether caused by infection by computer virus, line drop out, bugs, tampering, unauthorised intervention, fraud, technical failures or any other cause beyond the control of the Promoter which corrupts or affects the administration, security, fairness or integrity of the Promotion) the Promoter reserves the right in its sole discretion, (subject to any written direction given by a relevant regulatory authority), to cancel, terminate, modify or suspend the Promotion. “The fairness and integrity of the competition was compromised because of the faulty App… Jeep should own up to this and cancel the promotion,” Frank says. He hopes the legal outcome will force Jeep to terminate the promotion and would like to see the brand donate the value of the 10 Cherokee Longitude’s to a charity as a peace offering for the negative customer experience had by many. It’s reported the promotion phone number was released prematurely and posted on a Whirlpool user forum, for some, the phone number never appeared when the App’s countdown function reached zero and for others, the number miraculously appeared the evening prior. Renee Blake, a Jeep App user expressed her frustrations when the landing page for the application mysteriously disappeared the evening before the phone number was set to be revealed, “the countdown came back on the following morning at about 6am, but by 9am when it reached zero, no phone number appeared… the number was revealed on my phone at 9:03am,” Blake says, by which time the 10 winners and 50 back-up participants had been selected. Could all of this been prevented? Peter Brown CEO of software company Ecetera says so. “Brands should be delighting customers…Too often we see and hear of scenarios like the massive click frenzy failure that could have been prevented.”Brown explains how companies like Ecetera provides a full range of cost-effective testing services that cover functional testing, performance and load testing to applications such as Jeep’s. 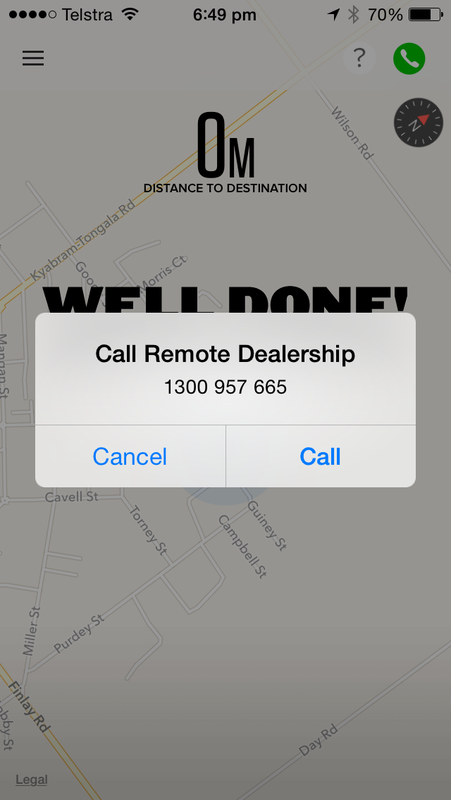 Mark McCraith, Director of Marketing, Fiat Chrysler Group last week insisted Jeep Australia took every precaution necessary to ensure the smooth-running of the promotion, suggesting the App had been tested by a number of employees prior to going live. Jeep refused to comment on the extent of application testing when contacted by B&T this morning. Brown expected a corporation as large as Jeep to run a flawless campaign especially in light of such high profile App failures such as Obamacare and last year’s Myer Christmas fail. The complaints tally to Jeep Australia is probably nearing the length of a child’s endless wish-list to Santa. McCraith last week said they would directly contact those who lodged complaints to Fiat Chrysler Group. Jeep Australia might need a bit of Kriss Kringle’s magic if they’re to swiftly remedy the botched competition, appease the masses and restore the reputation of the 63-year-old brand. The competition was created in conjunction with agency Cummins & Partners and activation agency Wonder. B&T contacted Cummins and Partners and is awaiting a response. Jeep is not a client of B&T.